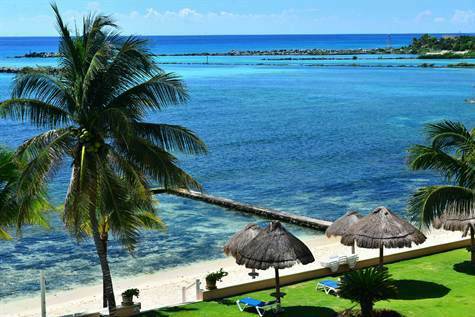 Make the Mexican Caribbean Your New Home. Together with one of our colleagues we like to show you this amazing real estate opportunity in the Riviera Maya. This is the view you long for when you look for your Mexican beach home!!!!!! And Villas del Mar II is the complex. Not too big, not too small. Just right at 28 units with a large pool, beautiful garden and lovely beach AND THE OCEAN IS RIGHT THERE! 402 is a penthouse, so it´s far from the madding crowds but a short elevator ride away from all the fun and quick walk to the marina with it´s shops and restaurants that are improving everyday. 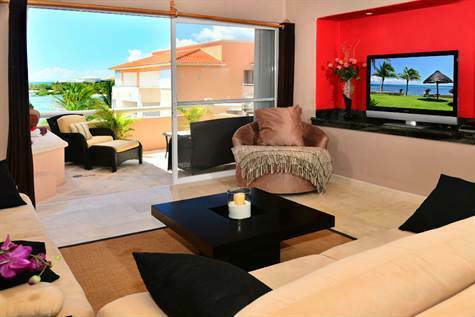 You have a large living room with separate dining area and open kitchen, half bath with laundry, the master ocean facing bedroom has ensuite bath as does the guest room which has it´s own slice of ocean view courtesy of Quinta del Sol´s open gardens and beach! When you approach the front door you see the ocean all the way! The condo is furnished tastefully as is the comfortable terrace with it´s obviously great ocean views and jacuzzi for laten night splashing about and it comes complete with a big barbeque! Make your new home In Villas del Mar II´s beachfront complex it´s 402 all the way!!!!! ▪ New Cuban Restaurant and soon to come our very first French restaurant…really French! 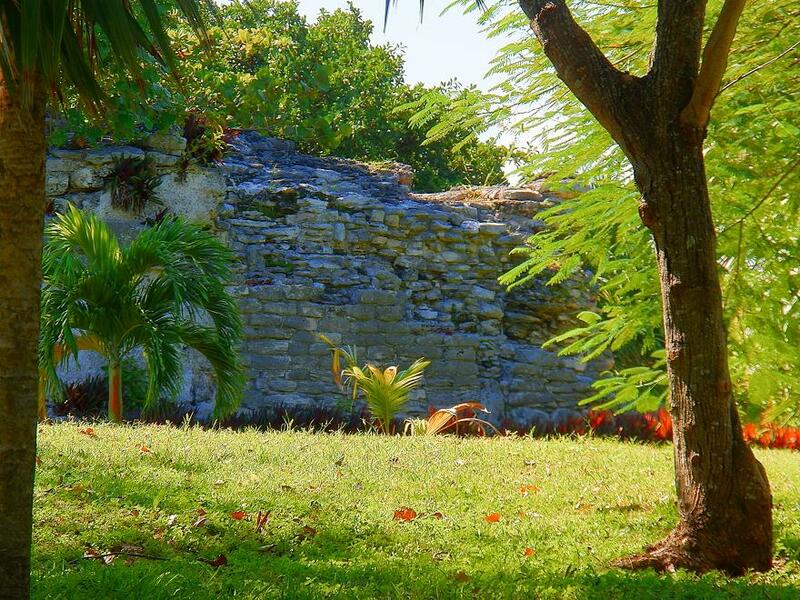 Have you been dreaming about seeing the ocean from your living room and sitting on your terrace overlooking a beautiful park with ancient Mayan Ruins? This is the perfect property than for you. A large 2 bedroom condo with a huge terrace facing the ocean and the mayan ruins. Nice wooden doors and window frames, creative finishing on the ceilings, beautiful common area and landscaping, amazing pool and the beach just 50 m down the road or you just walk through the mayan ruins. Playa del Carmen Real Estate has great opportunities waiting for you. Real Estate Playa del Carmen can offer you now the most amazing views over the Caribbean Ocean on Full Moon Nights. or check out the main website Homes for Sale Playa del Carmen or find more great opportunities on our Facebook Site or see videos of the properties on Youtube. One more great Condo for Sale in Playa del Carmen Real Estate News. From one of Playas Best Developers remodeled Penthouse, reduced to sell quick, offering amazing ocean view from bedroom, living room and of course your own very private, very spacious rooftop terrace with its own small pool. This Home for Sale offers you everything you have been wishing for. Kitchen and appliances are included and of top quality. Great Investment, Unbelievable Views, Privacy, High Rental Potential and the pride of owning one of Playa del Carmen’s most desired Properties. Contact us in Homes for Sale Playa del Carmen and get the newest, most desired Properties right away in your mailbox. If you have not found your dream Real Estate in Playa del Carmen yet, it definitely is time to contact us!!! For Americans and Canadians this Caribbean Winter showed Great Opportunities to buy a Condo in Playa del Carmen and many new owners are right now furnishing their beautiful new homes in the Caribbean with us. Playa del Carmen Real Estate has everything Investors can ask for. Oceanfront Homes, Condos for Sale, Villas and townhouses with great return on the initial investment and I would like to introduce one of my favorites to you. Studio 1 is located just a few meters away from the amazing Coco Beach, a brand new development and definitely a gem if you look for real estate for sale in Playa del Carmen. The complex is build from Playas best developer and is very modern with great finishing in every unit and perfectly designed common areas featuring a rooftop pool with views over the Caribbean Sea. And if you would like to read view interesting things about buying properties in mexico, click on the picture. Our friends from Homes for Sale Playa del Carmen Blog wrote down some very helpful articles. What do you expect from your Agent for Real Estate Playa del Carmen ? And what you definitely should expect!!! Your Realtor is a very important part of selling or buying Real Estate in Playa del Carmen. You should choose wisely and it will definitely save you money and time. Established real estate agents haаveе theе experience оfor showing ееі Playa del Carmen Real Estate market hаs changed оvеr thе years. This year has been a very interesting one in Playa del Carmen Real Estate and there were many properties sold so far in the entire Riviera Maya. Definitely the best place to invest for American and Canadians is Playa del Carmen. There a many condos for sale and you really save yourself time and in the end money, if you use the skills and experience of a good realtor. The Team of Homes for Sale Playa del Carmen is there 24 hours every day for you and will make sure, your experience of buying a home away from home will be a Success Story.